← Flower Design Competition Today! 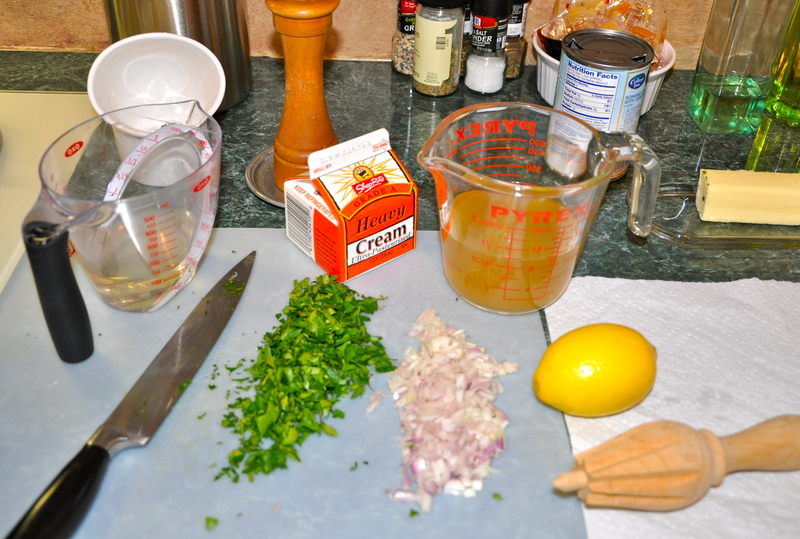 Last night I made Suzanne Michaud’s recipe Braised Chicken with Lemon and Dill. I met Suzanne in December when she was the chef/teacher at my girlfriend Gail’s home cooking class. I took plenty of great recipes away that night, and now I subscribe to Suzanne’s blog, Comfort Food Stories. This recipe, which arrived in my email box recently, can be found here. Click on the link to get the recipe and see what the finished dish looks like. Yum! 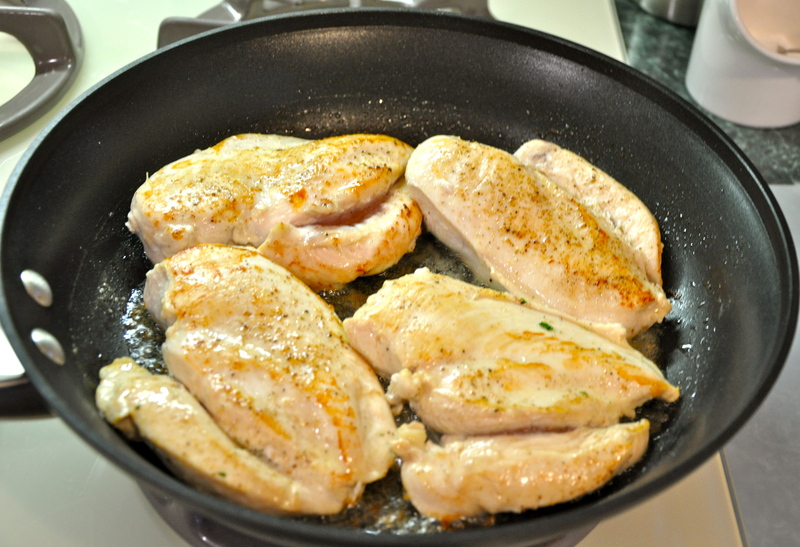 I browned the chicken in a combo of canola oil and butter. Since my husband Mike is a picky eater, I replaced the dill with fresh chopped parsley for a milder taste. We love the dish, which is flavorful, tender and easy to make. And when Suzanne said it’s quick to make, she really meant it. I’m glad I took her advice and had everything prechopped and ready to be popped into the pan! I had everything standing by to be popped into the skillet. Fast hands! 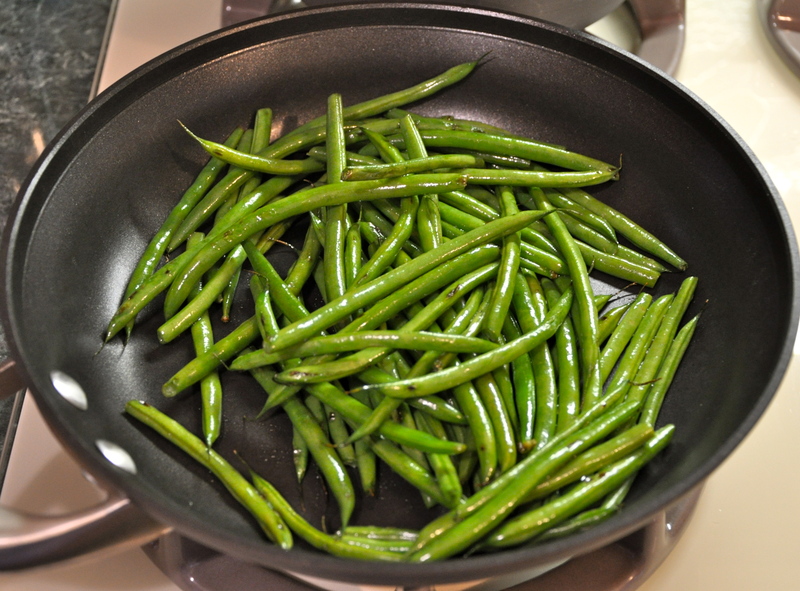 These are the sauteed beans for a yummy side dish! Just a few drops of oil and saute away! I'm hoping to be up and running soon! Separately, some of you know that I am in the throes (yes, throes) of transferring my blog to a self-hosted format. Since I am not a programmer, or anything even close, my learning curve has been steep, but I am making progress! I have a domain name (adventuresofamiddleagemom, of course!) and a host; I am pointing unseen programming arrows in the right directions and figuring out how to import my old blog posts into my new site. Last night I wasn’t patient enough and I ended up with only half of my old posts imported and now have to go back like three steps and start again. <sigh> Has anyone else done this successfully? Anyway, keep your fingers crossed I can make the transition successfully. In the meantime, if I am not posting as often you know it’s because I’m mentally exhausted from trying to get all my acronyms straight and the unseen arrows pointed properly! Glad you enjoyed this meal. Herbs are a very personal thing. Next time, you might also try tarragon or even a little rosemary (just minced finely and use less — maybe just a tsp or two). Stay tuned for more quick meals. I noticed that you have the recipe tagged to my name — thank you so much! Would you mind just correcting the spelling of my last name — its Michaud — that way, fans will be sure to find me. Thanks for the herb tip! My daughter Tory and I would have been delighted with the dill in the original recipe; however, Mike is a bit stuck in the mud when it comes to his taste buds. First your meal looks and sounds wonderful! Second, good luck and best wishes with your blog transfer. I’ve thought about moving many times, but I chicken out. WordPress just came out with a new feature. They’ll move your entire blog to your self-hosted wordpress site for $99. It may be too late for you, but it’s always an option. Can’t wait to see the new blog!